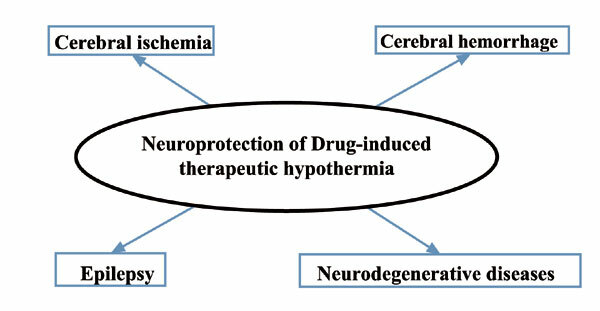 Objective: This review article focuses on the neuroprotective effect of drug-induced hypothermia in cerebrovascular diseases and discusses its related side effects. Method: A systematic literature search was performed using Pubmed and Embase electronic databases for a retrospective analysis. Results: Experimental studies have shown that drug-induced hypothermia alleviates brain damage and plays a neuroprotective role, thereby reducing mortality and ameliorating neurological deficits. Therefore, drug-induced hypothermia has an important research value and is worth further consideration in the clinical setting. However, drug-induced hypothermia is also associated with side effects, such as ventricular tachycardia, ventricular fibrillation, suppressed immune function, infection, electrolyte imbalance, glucose metabolism disorders, and skeletal muscle tremor. Existing drugs with cooling effects belong to the following categories: (1) dopamine receptor agonists; (2) cannabis; (3) opioid receptors; (4) vanilloid receptors; (5) vasopressins (potent neurotensin receptor agonists); (6) thyroid drugs; (7) adenosine drugs; and (8) purine drugs. Keywords: Drug-induced therapeutic hypothermia, neuroprotection, cerebrovascular diseases, cerebral hemorrhage, cerebral ischemia. Keywords:Drug-induced therapeutic hypothermia, neuroprotection, cerebrovascular diseases, cerebral hemorrhage, cerebral ischemia. Abstract:Objective: This review article focuses on the neuroprotective effect of drug-induced hypothermia in cerebrovascular diseases and discusses its related side effects.